NEW DELHI --- India on Thursday inked yet another mega defence deal worth over $3 billion for the lease of a nuclear-powered attack submarine from Russia, despite the threat of US financial sanctions still looming over the earlier $5.4 billion contract inked for Russian S-400 Triumf missile systems in October last year. Defence sources said the over $3 billion (around Rs 21,000 crore) contract for the Akula-1 class submarine, which will be ready by around 2025, includes a comprehensive package for refurbishment of the nuclear boat lying mothballed at Severodvinsk, its sustenance and spares support for 10 years, as well as training and technical infrastructure for its operations. This submarine will replace INS Chakra, the Akula class submarine taken on a 10-year lease from Russia in April 2012, under a secret over $900 million deal inked way back in January 2004. “INS Chakra’s existing lease will be extended till at least 2025 through another contract till the new submarine, which will be bigger and more advanced than it, becomes operational,” said a source. 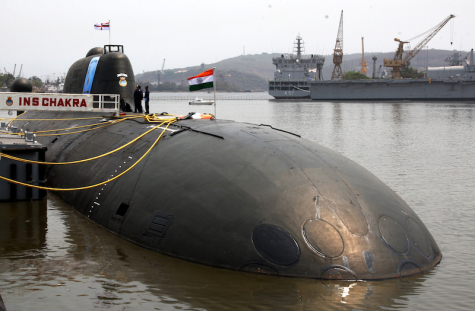 It was in November last year that India declared its first indigenous nuclear-powered submarine with nuclear-tipped ballistic missiles (called SSBN in naval parlance), INS Arihant, had successfully completed its “first deterrence patrol” . It meant that the country’s long-awaited nuclear triad -- the capability to fire nuclear weapons from land (Agni missiles), air (fighter-bombers) and sea (SSBNs like INS Arihant) – was finally operational to some extent.